The Digital Media Machine: Healthcare: A promising vertical for Google Glass? 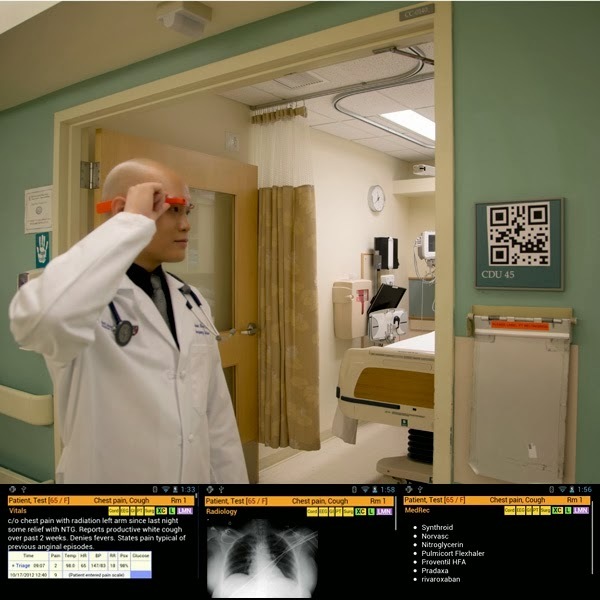 Healthcare: A promising vertical for Google Glass? Last month, I spotted a very interesting blog post about Google Glass by John Halamka, M.D., the CIO of one of Boston's largest research hospitals. Google Glass, a virtual reality system embedded in a pair of eyeglasses, has been given a bad rap in the media by a series of minor controversies involving whether people are recording or photographing things that they shouldn't. But the usage of Glass that Halamka describes is one of the few examples that I've seen of the technology providing a measurable improvement over older technologies -- in this case, emergency room systems used to present patient information to doctors and other staff. When a clinician walks into an emergency department room, he or she looks at bar code (a QR or Quick Response code) placed on the wall. Google Glass immediately recognizes the room and then the ED Dashboard sends information about the patient in that room to the glasses, appearing in the clinician’s field of vision. The clinician can speak with the patient, examine the patient, and perform procedures while seeing problems, vital signs, lab results and other data. Beyond the technical challenges of bringing wearable computers to BIDMC, we had other concerns—protecting security, evaluating patient reaction, and ensuring clinician usability. Patients have been intrigued by Google Glass, but no one has expressed a concern about them. Boston is home to many techies and a few patients asked detailed questions about the technology. Our initial pilots were done with the bright orange frames—about as subtle as a neon hunter's vest, so it was hard to miss. Staff has definitely noticed them and responded with a mixture of intrigue and skepticism. Those who tried them on briefly did seem impressed. We have fully integrated with the ED Dashboard using a custom application to ensure secure communication and the same privacy safeguards as our existing web interface. We replaced all the Google components on the devices so that no data travels over Google servers. All data stays within the BIDMC firewall. We have designed a custom user interface to take advantage of the Glass’ unique features such as gestures (single tap, double tap, 1 and 2 finger swipes, etc. ), scrolling by looking up/down, camera to use QR codes, and voice commands. Information displays also needed to be simplified and re-organized. We implemented real-time voice dictation of pages to staff members to facilitate communication among clinicians. Google Glass does not appear to be a replacement for desktop or iPad—it is a new medium best suited for retrieval of limited or summarized information. Real-time updates and notifications is where Google Glass really differentiates itself. Paired with location services, the device can truly deliver actionable information to clinicians in real time. "Over the past 3 months, I have been using Google Glass clinically while working in the Emergency Department. This user experience has been fundamentally different than our previous experiences with Tablets and Smartphones. As a wearable device that is always on and ready, it has remarkably streamlined clinical workflows that involve information gathering. For example, I was paged emergently to one of our resuscitation bays to take care of a patient who was having a massive brain bleed. One of the management priorities for brain bleeds is to quickly control blood pressure to slow down progression of the bleed. All he could tell us was that he had severe allergic reactions to blood pressure medications, but couldn’t remember their names, but that it was all in the computer. Unfortunately, this scenario is not unusual. Patients in extremis are often overwhelmed and unable to provide information as they normally would. We must often assess and mitigate life threats before having fully reviewed a patient’s previous history. Google glass enabled me to view this patient’s allergy information and current medication regimen without having to excuse myself to login to a computer, or even loose eye contact. It turned out that he was also on blood thinners that needed to be emergently reversed. By having this information readily available at the bedside, we were able to quickly start both antihypertensive therapy and reversal medications for his blood thinners, treatments that if delayed could lead to permanent disability and even death. I believe the ability to access and confirm clinical information at the bedside is one of the strongest features of Google Glass. " We have been live clinically with Google Glass for a limited set of four emergency physicians serving as beta users since 12/17/13. Since then, we have been working on improving stability and adding features to improve usability. Some of these modifications include the addition of an external battery pack, increasing the wireless transmission power, pairing the headset with our clinical iPhones, using head tilt to control vertical scrolling, revamping our QRcode reader to improve application stability, adding an android status bar to show wireless connection strength and battery power. In addition to our four beta users, we've also had impromptu testing with at least 10 other staff members since 1/24/14 to get feedback to refine the user experience. As a device being used in clinical care, we needed to rigorously test our setup to ensure that the application is not only reliable and intuitive, but improved the workflow of clinicians rather than impede it. I believe wearable computing will replace tablet-based computing for many clinicians who need their hands free and instant access to information. Dr. Halamka indicated that the pilot was a success, and said a full roll-out was anticipated in the coming weeks. It should be interesting to see if this learning experiences of this experiment can be applied to other medical settings, not just at BIDMC but also other hospitals and clinics. Of course, besides improving the interface and other aspects of the data being delivered to caregivers, developers need to consider how the technology may impact other aspects of running a hospital and interacting with patients. VR may be a large chasm for patients and some staff to cross, and there is also the issue of whether the usage of such technologies requires FDA input.